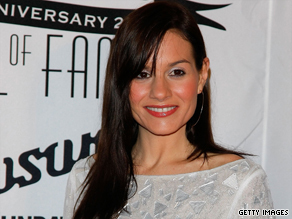 "American Idol" judge Kara DioGuardi will be back on the show next season, officials announced Monday. DioGuardi continues to work as a songwriter and producer, most recently with a diverse group of performers including Pink, Kelly Clarkson, Theory of a Deadman, Jessie James and Tom Jones. She was also recently honored with the 2009 Icon Award granted for personal achievement to outstanding songwriters by the National Music Publishers’ Association. News of DioGuardi’s return comes as the future continues to be unsure for fellow judge Paula Abdul. Abdul, who has been with the show since its debut, has yet to sign a contract to return next season. Abdul has thanked fans for their support via her Twitter account and said she continues to “try to work out details” of her return. “Your support & encouragement means so much to me,” the singer said via Twitter on July 30. “I hope you understand I can only return to [‘Idol’] if the deal is fair.” DioGuardi joins judges Simon Cowell and Randy Jackson on “Idol” as well as Ryan Seacrest, who recently signed a three-year, $45 million deal to continue as host of the show.